Setting the Record Straight. " The rest of the story "
Lewis and Clark or anyone else never walked across the Snake River on the backs of salmon like the dam removal and dam breaching advocates continue to say and are still preaching today. This salmon and dam history and time-line is collected from a variety of sources. This is an Awesome Google Map that allows you to zoom down on their campsites.
" 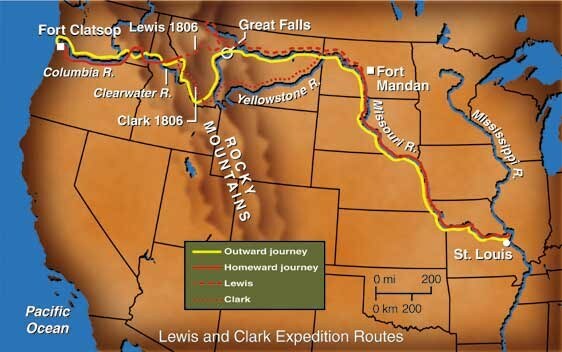 Nowhere does it say Lewis and Clark walked the across the Snake River on the backs of Salmon. This is one of the biggest examples of fabricated misinformation that is used today. The dam removal and dam breaching advocates continue to use this as a common references to describing a natural river which is in turn used to support Dam Removal and Dam Breaching. " One of the biggest information deceptions and manipulations of facts is that the salmon runs in the early 1800's numbered 16,000,000. This is totally incorrect which is documented by the real Lewis and Clark. If you would like more information about Lewis and Clark and what they saw in the early 1800's then please go to this web site, Lewis & Clark Historic Trail I would encourage you to educate the environmentally challenged about the real Lewis and Clark, and let them know that they almost starved to death. You can also let them know that if they were eating dog and horse meat then they most certainly were not walking across the Snake River on the backs of salmon as some still are saying today. This is their fabricated historical evidence to support breaching dams and removing dams. The following information is from a portion of the North Pacific Research Saving Salmon report by Don Dodd. Eye witness Accounts of Early Historical Runs. We have the accounts of two exceptionally accurate and thorough individuals who were instructed by the President of the United States to record natural wonders and resources. Lewis and Clark hit the Clearwater River on September 21, 1805 near what should have been the peak of the fall salmon run. A fall run as large as 8-10 million salmon would surely have been noted in the journals of these men, particularly because they were near starvation. During that time, they were reduced to eating dried salmon, roots, horse and dog meat. It is hard to believe that backwoodsmen would dine on dried salmon if fresh were available. Their first notation on fresh salmon occurred 4 days later when they managed to catch 6 fish. On the last day of September, they noted a great number of small ducks passing down the river. It is curious that they should mention a few hundred ducks, and not mention the millions of salmon presumed by the popular notion to be in the river. On October 10, after being on the river for 3 days and passing 30 rapids they came to an Indian village. They discussed the lives of the natives living on the river as the pursuit of summer and fall salmon fishing. However, there was no notation about any ongoing salmon run, which should have been a big event for the village. In addition, salmon should have been noted leaping at least in some of the rapids, as well as references to dead and dying spent salmon. On the 13th of October they came to Monumental Rock in Walla Walla County and noted that this was obviously a great fishing place. They noted, "a number wholes of fish." The spelling is so bad, that one is not sure whether Clark meant fishing holes or whole salmon. However, they neither noted large numbers of fish, alive or dead, nor Indians fishing.] Thus, on the entire trip down the Clearwater and Snake Rivers this starving party of backwoodsmen dutifully recorded when they ate duck, dog or deer, but recorded eating only 6 salmon. This from two rivers that the biologists would have us believe were teaming with fish, Historically the Snake River fall component of this ESU was the predominant source of Production. Finally, on October 17, 1805, Lewis and Clark reached the Columbia and made their first notation about observing great numbers of dead salmon. They spend a day exploring up stream near Pasco and found the Indians apparently near the middle of the fish harvest. They reported salmon drying on racks and dried salmon stored in baskets. Thus, the salmon run must have been going on for some time. Why were there so few salmon in the Snake and the Clearwater? If we assume the Indian salmon catch was several hundred thousand, where were the 7-9 million dead salmon left over from the run? The number of animals and birds attracted to this bountiful harvest would have been noted in their journals. No dead salmon were noted in the Snake or the Clearwater. Does that mean the Snake was not heavily used for breeding? They did begin to partake and enjoy fresh salmon at this point in the trip, although they were still starving and eating dogs and horses. They made several more notations on salmon as they passed Indians fishing further down the Columbia. On the 22nd of October, they reached Celilo Falls, the great pinch point on the Columbia, where the salmon were forced into expending tremendous efforts to pass upstream. Eight to ten million salmon passing this spot would require 12 salmon a second leaping up the falls, night and day for 10 or 12 weeks, an event that would astound any observer and leave a lasting impression. Yet, these skilled observers said very little about salmon. The notations in the journals are rather mild. Instead a notation about the great number of sea otters (now thought to be seals) below these rapids 200 miles inland. They mention large numbers of seals two other times as they proceeded down river. This speaks to the abundance of seals not salmon and the direct connection between the two. Lewis and Clark ran up the river during the spring salmon run of 1806, again with minimal notation about salmon. The science of anthropology and sociology provide further evidence of very small salmon runs before development of the Pacific Coast. It is common knowledge that the Indian nations along the Columbia River relied on salmon as a major food source. Since the Indians' culture was built around not wasting natural resources, they would only take what they could eat or trade. The Indians traded salmon as far away as the plains. The tribal groups along the river would be hard pressed to use and catch any more than 25,000 to 50,000 fish each. Thus, it can be assumed that the entire Indian take of salmon on the river would be less than 500,000 fish. Some have estimated it as high as 900,000. It is also known that many of these nations had developed a ritual around the arrival of the first salmon to ensure that the runs would be bountiful. This implies that there were runs that were not adequate and these shortfalls occurred often enough to generate the need to invoke divine intervention to ensure success. Thus, there must have been many years when a single tribe caught less than 25,000 fish. Assuming that the Indian's catch efficiency, previous to 1800 was only 5%, (Compared to as high as 85% attributed to the catch of 1883, this would indicate runs in the Columbia River less than 500,000 salmon. Therefore, it appears from personal observations and several lines of scientific reasoning that the numbers for pre-Lewis and Clark salmon runs are grossly overstated and may have been considerably lower than they are today. If this is indeed true, then the whole basis for returning the river to pre-1850 conditions goes away. In its present condition, the river is producing between one and two million fish per year. By removing all the dams, farms, industry, towns and logging within two hundred miles of the Columbia and its tributaries; completely restoring all the wet lands and the river to its 1805 condition, the probability of increasing the salmon runs is extremely low. Further, if we increase the number of salmon by any means without artificial predator control, we will simply increase the number of salmon predators for a short period. Eventually, as any biologist understands, the salmon numbers will return to the status quo and the bloom will be over. The only lasting result of improving the habitat will be many more free running streams and vast forests of old growth timber. In the early 1800's the salmon runs were about 500,000. ( Not 16,000,000 as the dam breaching opponents are saying ). Traders begin buying and selling salted salmon in 1829. In 1855, treaties with Northwest Indian tribes establish the principle of tribal rights to fish in "usual and accustomed places." In 1859, the first irrigation project in the Columbia Basin goes into operation. The first salmon cannery on the Columbia River opens in 1866, beginning the era of commercial salmon harvest. Twenty years later, there are 55 canneries on the Columbia. The first salmon conservation law in the region, making it illegal to block salmon streams, is passed by the Washington Territorial Legislature in 1871. In 1875, the Oregon Legislature asks the US Fish Commissioner for advice on saving salmon. That official cites overfishing, habitat destruction and dams as major problems. The first salmon hatcheries opens on Oregon's Clackamas River in 1876 and on the Willamette River in 1877, indicating concern for decline of the wild salmon resource.
" I seek a larger reservation for my people. I complain of the use of net in the lower Columbia. Much suffering will ensue because my people have not been able to lay in stock enough salmon for their winter food. By 1883, Columbia Basin chinook salmon runs begin to decline. (1883 The lower Columbia River commercial fishery captures 43 million pounds of chinook salmon, the largest catch ever recorded). On August 7, 1883, Berneral Sherman spoke again on the topic, as reported in the Congressional Record: " The Kettle Falls River on the Columbia River From time in Memorial has been the place for fishing for the Indians. Salmon have now become scarce because of the canneries at the mouth of the Columbia". Harvest on the Columbia peaks in 1895. In coastal Oregon and Grays Harbor, it peaks in 1911; in Puget Sound in 1913 and in coastal Washington in 1915. In 1894, the US Fish Commission begins an investigation of an "alarming" decrease in Columbia fish runs. (1899 The number of fishwheels in use on the Columbia increases to seventy-six. These giant fish-catching devices which look like ferris wheels with scoops in place of seats, use the river's current to catch enormous numbers of salmon). Individual fishwheels take forty to fifty tons of salmon per year). "The Salmon fisheries of this state have, in the past, been wonderfully productive. Of late, however, evidence of a decrease in the run is apparent, and all are agreed that something ought to be done to prevent the final extinction of s great industry". In 1901, the Washington State Legislature closed fishing on the Columbia and three miles out in the Pacific From March 1- April 15 and Aug 15 - Sept 10 to protect the major fish runs. In 1909, the Central Fish Hatchery in the Bonneville area of the Columbia goes into operation; at that time, it is the world's largest hatchery. Offshore trolling for salmon begins in 1912; before that time salmon are harvested in rivers. By 1920, more than a thousand power boat trollers are in operation. By 1920, the US Bureau of Fisheries determines that hatcheries do more harm than good to salmon runs. The first dam on the Columbia River (Rock Island) is built in 1933, after the historic runs are already drastically reduced. The project is built with fish passage facilities. The Army Corps of Engineers completes Bonneville Dam, with fish passage facilities, in 1938. In 1938 Congress passes the Mitchell Act, which leads to the construction or modernization of 40 hatcheries. The first Mitchell Act hatchery opens in 1949. Grand Coulee Dam foes into operation in 1941, completely blocking salmon spawning upstream. The 350-foot height of what was then the biggest dam in the world made fish passage engineering impractical. An enormous fish hatchery is built near Leavenworth on Icicle Creek to make up for lost salmon spawning habitat. The legendary Indian fishery at Celilo Falls is flooded in 1956 by the waters behind the Corps of Engineers dam at The Dalles. Beginning in 1933, fish passage facilities are built into all Columbia mainstem dams below Chief Joseph. Those include: Wells (1967), Rocky Reach (1956), Rock Island (1933), Wanapum (1965), Priest Rapids (1961), McNary (1957), John Day (1971),The Dalles (1956) and Bonneville (1938). In 1965, Idaho Department of Fish and Wild life begins poisoning salmon areas to develop sport trout fishing which has more economic importance to the State of Idaho than salmon fishing. This went on during the 60's,70's, 80's and 90's and is probably one of the major reasons for the salmon declines in Idaho. In 1967, Idaho Power completes Hells Canyon Dam, which blocks off salmon spawning habitat upstream on the Snake River. In 1970, the usage of monofilament fishing line goes into mass production for the Commercial Fishing Industry. ( This is the first major high technical improvement in fishing equipment ) . The Corps of Engineers dams on the lower Snake--Ice Harbor (1961), Lower Monumental (1969), Little Goose (1970) and Lower Granite (1975)--are built with fish passage facilities and a barge system that collects juvenile salmon and transports them downstream for release beyond the last dam. The greatest salmon and steelhead returns in recent times comes in 1985 and 1986, a decade after completion of Lower Granite, the last Columbia-Snake River dam. The Lower Snake River Compensation Plan of 1976 creates 12 hatcheries and 11 satellite hatcheries in Idaho, Oregon and Washington, to mitigate for the dams. In 1969, US District Judge Robert Belloni of Oregon (US v. Oregon) rules that a state is limited in its power to regulate treaty Indian fisheries, restricting regulation to what is "reasonable and necessary for conservation." The ruling requires states to use the least restrictive means to regulate and prohibited discrimination against Indians. By 1973, monofilament fishing lines and nets are in full scale use in the Commercial Fishing Industry. In 1973, the Endangered Species Act is adopted and is used to protect threatened and endangered Seals and Sea Lions. They are major predators of salmon and they have been doubling in population ever eight years since this time. In 1974, US District Judge George Boldt of Washington (US v. Washington) affirms the right of Northwest Indian tribes to fish and manage fisheries under early treaties, ruling that Indians are entitled to share equally with non-Indians in the harvest of fish in traditional fishing areas. The ruling also outlaws State regulations which go beyond fishery conservation to regulate time, place, manner and volume of off-reservation treaty fisheries. In 1975, the use and of High Tech Electronic Fish Finding equipment is introduced and adopted by the Commercial Fishing Industry. ( This is the second major high technical improvement in fishing equipment ). In 1974, Judge Bolt ruled that tribes were entitled to half the catch. This started their use of gill nets. ( For your information Judge Bolt was married to a Indian ). In 1980, Congress passes the Pacific Northwest Electric Power Planning and Conservation Act, setting up a four-state Northwest Power Planning Council. The NWPPC is charged with writing a plan that will remedy fish & wildlife problems associated with the building and operation of federal hydroelectric dams in the Columbia Basin. Funding comes from hydro power customers, through the Bonneville Power Administration (BPA). Two years later, the NWPPC passes its first fish and wildlife plan. In 1990, the Shoshone-Bannock Indians of Idaho files a petition to list Snake River sockeye under the ESA. Later that year, the environmental group Oregon Trout is the lead petitioner to list Snake River spring, summer and fall chinook. In 1991, the National Marine Fisheries Service (NMFS) adds Snake River sockeye to the endangered list. A year later, Snake River spring-summer and fall chinook are listed as threatened; later their status is changed to endangered. In a 1995 ESA document, NMFS declares that hydro operations in the Columbia and Snake Rivers will be governed by flood control and fish passage flows rather than power generation needs. The hydroelectric dams still generate power, but the Federal Columbia River Power System capacity is reduced by 550 megawatts--more than half the power needed to meet Seattle's average load. In 1996, BPA negotiates an agreement that caps the power agency's fish & wildlife expenditures at $432 million, a figure including lost power sales revenue. The cost of BPA fish & wildlife programs since the passage of the 1980 Power Planning Act is estimated at $3.5 billion, including lost power sales. In a 1996 study, the Salmon Task Force of the Washington State legislature estimated that the region spends $1 billion annually on fish & wildlife. In a unanimous 1997 ruling, the US Supreme Court says that anyone who claimed they have been damaged economically by ESA actions can bring lawsuits against the federal government. Previously, lower courts ruled that economic issues are precluded from ESA lawsuits. In 1998, NMFS proposes 13 wild salmon runs from Sacramento to the Skagit River for ESA protection--the largest scope of any present listing under the ESA. Included are several chinook runs – in Puget Sound, the Upper Willamette River, Upper Columbia River spring run, additional fall Snake River runs, and three other small runs in Oregon and California. Also on the list are steelhead in the Middle Columbia (including fish in the Yakima, Umatilla and John Day basins) and Upper Willamette; chum in Washington's Hood Canal and the Columbia River, and a small sockeye population in Lake Ozette on the Olympic Peninsula. The downward trend for salmon started about 1883, after the commercial salmon harvest which started in about 1866. The declining salmon runs started long before there were any large dams on the Snake or Columbia Rivers. Today there are now more fish then there were before dams were constructed on the Snake and Columbia Rivers the major difference is that these are mostly hatchery salmon.